To me, there’s something a bit mystical about Midsummer’s Day, the longest one in the whole year. Perhaps it was being raised by a Shakespeare professor — I half expect to see fairies peeping through the trees in the long, slow evening, tempting me with apricocks and dewberries, purple grapes, green figs and mulberries. Perhaps it’s just that deepseated human yearning for light and sunshine. Or maybe it’s the strawberries. In Sweden, whose northern latitude means the dark of winter is very dark indeed, they know how to celebrate the glorious (very) long days at midsummer. In the middle of June, they hold a midsummer festival, featuring flowers, feasting, and the short strawberry season. 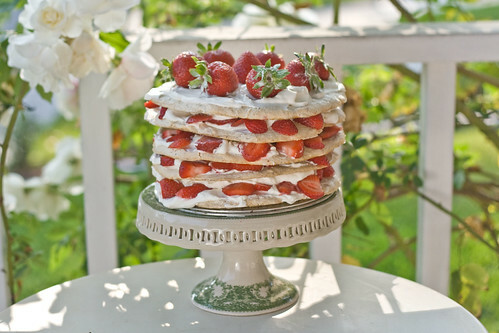 This cake is inspired by the traditional Jordgubbstårta, or Swedish Midsummer Strawberry Cake. It’s traditionally made with spongecake, strawberries and cream, but I decided to tart it up a bit by replacing the spongecake with layers of almond laced meringue, and giving them a Scandinavian flair by adding a trace of cardamom. 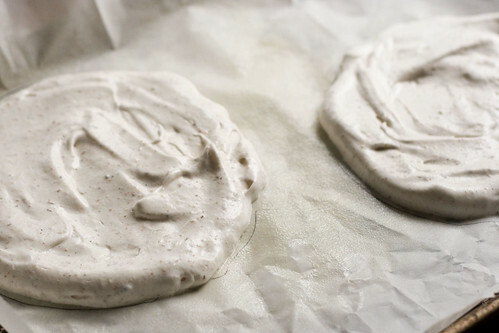 It doesn’t require any special pans — the meringue is just dolloped onto baking sheets lined with parchment and greased. Then spread into pre-set circles and baked in a very low, slow oven for a few hours before you stack them with cream and strawberries. The result is a cross between a Swedish Midsummer Cake, a French Macaron or Dacquoise (the big sister to the macaron), an English Victoria Sponge, an American strawberry shortcake, an Australian Pavlova and my weird imagination. A very good cross. Let’s just say that four people demolished the entirety of this eight inch cake in one sitting. The edges of the meringue stay crisp, while the cream and the juicy strawberries soften the center into a creamy, light cake. It’s the very essence of summer — light and almost insubstantial, but deeply satisfying. It might even tempt the fairies out of hiding …. Preheat the oven to 350 degrees. Line three baking sheets with parchment paper; trace 5 8-inch circles on the sheets of paper (2 on 2 sheets, and 1 on the third), and grease the sheets with butter and flour or Baker's Joy. In the bowl of a standing mixer (or a large mixing bowl with a hand mixer or a balloon whisk and a very strong arm), whip the egg whites until they form gentle peaks. Add the sugar gradually, ¼ cup at a time, and the salt, and beat at high speed until the egg whites form stiff and glossy peaks. Gently fold in the flour, almond flour and cardamom. Divide the mixture evenly among the five circles, and spread them to fit inside the circles, making sure that the layers have a fairly even thickness. Place in the oven, and immediately reduce the heat to 250 degrees. Bake for 25 minutes, or until the disks begin to color, then reduce the heat further to 200 degrees and bake for an additional 2 hours. Let cool slightly. Stem and slice the strawberries, reserving the prettiest specimens whole to adorn the top of the cake. 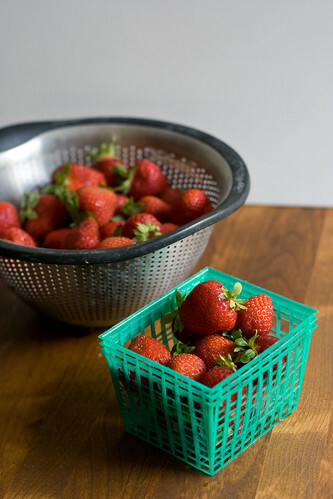 Sprinkle 1 T sugar over the sliced strawberries. In a large, chilled bowl, combine the cream, sugar and cardamom, and whip until billowy and holding soft peaks. 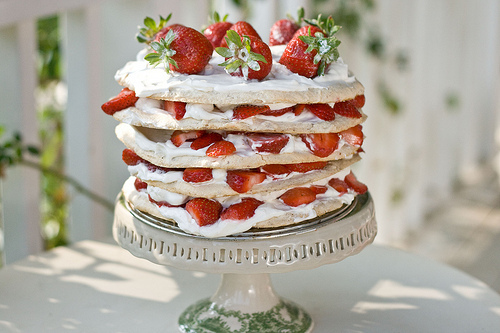 Place 1 layer meringue cake on a plate. 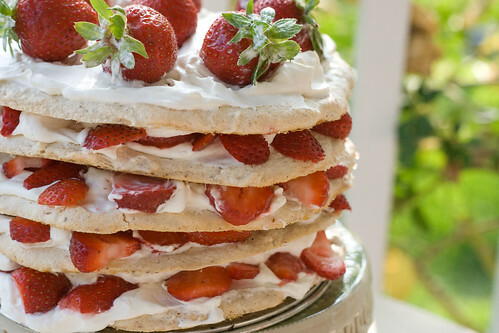 Top with whipped cream, ¼ of the strawberries, a little more whipped cream, and another layer of cake. Repeat. Frost the top layer with the last of the whipped cream and the reserved whole strawberries. Serve immediately if you want crisp layers; for a softer and creamier experience (the edges will retain some crunch, and the almonds also keep it a little crunchy) serve a couple of hours after assembly. Kate, this cake is dreamy! Well done girl 🙂 Perfect for parties & summer celebrations. Mmm, reminds me of a mille feuille. Beautiful and delicious at the same time. What a gorgeous looking dish! Definitely one to try. 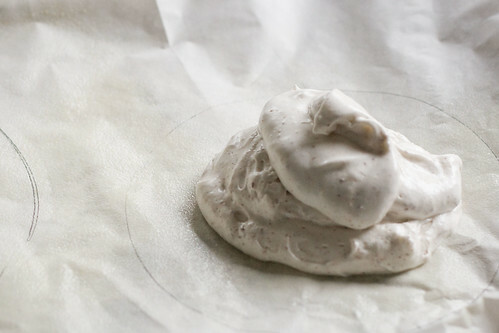 I LOVE meringue! That cake is unbelievably beautiful. Wow! I do love these long summer days! And I REALLY love fantastic cakes, like this one ya got here, lovely! Is almond flour hte same as ground almonds in the UK? Is it tough to serve? This was pretty good, I gotta say. I liked the texture of the meringue. It was pretty heavy on the whipped cream (to me that’s not a bad thing). I added some vanilla sugar as well as dark chocolate in the whipped cream. does the T in the recipe stand for tablespoon?